Strawberry muffins are perfect for summer, when fresh strawberries are at their peak and available in abundance. They bring back memories of summer throughout the year and are a real treat any time you make them. The hint of cinnamon is a terrific addition to the recipe and nice hint of flavor to the muffins. Combine the dry ingredients in a large mixing bowl. In a small bowl, combine the eggs and oil. Stir the strawberries into the egg mixture. Blend in the flour mixture until thoroughly combined. Do not overbeat. Spoon into greased muffin tins. Bake at 400°F for 25 minutes. Makes 2 dozen muffins. You can use frozen strawberries in this recipe but remember that frozen strawberries have much more liquid in them. Drain the excess liquid from the berries and add a touch less liquid to the batter to account for the wetness of the berries. These lovely strawberry muffins comes from Gooseberry Patch’s Country Baking Cookbook: Recipes for Freshly Baked Goodies From Grandma’s Kitchen. Kids will love these, and if you have kids who love to cook, baking muffins is a perfect activity to do with them. These easy muffins would be even healthier made with whole wheat flour instead of white. Just remember to sift the flour first. It makes the muffins lighter. 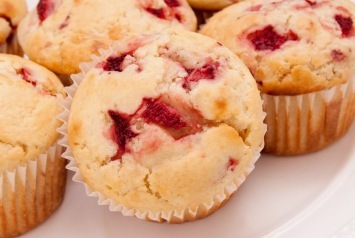 These strawberry muffins are just one of the muffin treats you can bake up. Find all of our muffin and biscuit recipes right here.